Biscotti have taken the cookie world by storm. Originally from the small town of Prato in Tuscany, Italy, biscotti (which literally means "twice cooked") have been transformed into large and long cookies of every flavour — and we are all the luckier for this transformation. Ideal for dunking into coffee, tea or the more traditional vin santo (sweet wine), these nutty cookies contain little fat and few calories. Standing the cookies upright during their second baking ensures that they dry out evenly, giving them their characteristic crunchiness. 1. To measure flour accurately, lightly spoon flour into dry measure, without tapping, until cup is heaping; level off with blunt edge of knife. In large bowl, combine flour, baking powder and almonds. 2. In separate bowl, whisk together eggs, sugar, butter, vanilla, almond extract and grated orange rind; stir into flour mixture until soft sticky dough forms. Transfer to lightly floured surface; form into smooth ball. 3. Divide dough in half, roll each into 12-inch (30 cm) long log. Transfer to ungreased baking sheet. 4. Brush tops with egg white; bake in 350°F (180°C) oven for 20 minutes. To prevent crumbling when slicing the partially cooked log of dough, use a sharp chef's knife and cut with firm, decisive strokes. Add 1/2 cup (125 mL) chocolate chips to flour mixture. Reduce flour to 1-1/2 cups (375 mL). Add 1/2 cup (125 mL) sifted unsweetened cocoa powder to flour. Omit almonds and add 1/2 cup (125 mL) chocolate chips. Dissolve 1 tbsp (15 mL) instant coffee granules in vanilla. Omit almond extract and orange rind. Substitute 3/4 cup (175 mL) whole hazelnuts or 3/4 cup whole pistachio's for the almonds. Omit almond extract. Makes about 2 dozen biscotti (cookies). These are great. 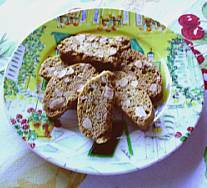 Try coconut biscotti. Looks very good. I will try them this weekend. Looks yummy, i'll make them today.